If you’re driving on Interstate 40 between Gallup and Albuquerque, you will come to a place where there’s a crust of dark lava on both sides of you. There’s grass and shrubbery and lichen all over it now, but it wasn’t long ago — only a few thousand years in some cases — that these flows were hot and quick and oozing right along. This is El Malpais, the badlands. A surface view of these flows is impressive as hades, especially if you can get some elevation on the Sandstone Bluffs Overlook or some altitude in an aircraft. From such a vantage, you’ll see an impressive swath of ominous land — a charred scar, matte black, many square miles in extent. What you won’t see, though, are the countless leagues of cave passage worming beneath the surface — lava tubes that eventually emptied of lava, leaving spectacular subterranean voids behind. To see these hidden places, you have to don a helmet, headlamps, knee pads and a study pair of boots. You’ll also need to get a permit from the rangers at El Malpais National Monument. 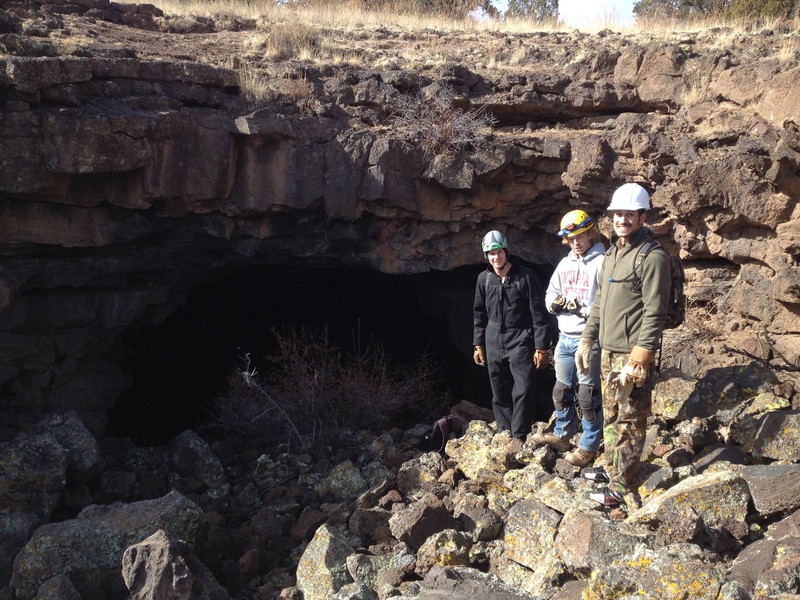 Having assembled the requisite gear and paperwork, my team — a quartet of amigos from the Albuquerque area — made its way to the mouth of Xenolith Cave. The name refers to chunks of heterogeneous rock welded to some parts of the cavern walls. At first, the space you’re navigating is tall and wide. Sharp rubble — detritus fallen from the ceiling — makes walking a little precarious, but you can stand comfortably upright. If you’ve traversed talus slopes in the mountains, this stretch is perfectly tractable. As you push forward, however, things begin to constrict. You hunch over, you crawl, and eventually you slither. It’s like one of those awful, Muybridge-esque evolution diagrams in reverse. As it turns out, reverting back to former means of motility is pretty exhausting. Our anatomy’s all wrong for these movements. But difficult as the going may be, there’s a sensation of being sucked though the passages — sucked through the narrow portals and slits. There’s a center of gravity back there somewhere that compels you to extrude yourself until you can extrude no more. Resistance is futile. We’ve all got the fever. Given our experience level, it’s probably a good thing that Xenolith is only about 600 feet in length. I can’t imagine how fatiguing it must be to wander the endlessly wending halls of Lechuguilla or Mammoth, which boast hundreds of miles of passage between them. Still, in spite of the modesty of our journey, we’re feeling high about making it to the end of the road. The final chamber is a small one with a cool draft sporadically ushering forth from a fissure that’s lined with a thin coating of evaporative calcite formations. It is here that we take advantage of the rare opportunity to experience complete darkness and near anechoic conditions. We kill the headlamps and sink into the inky silence for a few minutes. We wonder if this is what death will be like. Horizonless and empty yet strangely beautiful. We laugh at the horror of nothingness, and, in the manner of Plato, re-emerge into the land light not quite knowing where we are.